​With 10-20 inches of snow and heavy winds looming in the forecast, there are bound to be more than a few power outages in the coming days. During a power outage, it is especially important to remember key food safety tips. Taking simple steps like monitoring the temperature and condition of food can make the difference between safe food and dangerous food. Keep refrigerator and freezer doors closed as much as possible to maintain cold temperatures. Each time the door is opened, temperatures rise significantly. Refrigerators will keep food safely cold for about four hours if unopened. A full freezer will hold the temperature for approximately 48 hours (24 hours if it is half full and the door remains closed). Food may be safely refrozen if it still contains ice crystals or is at 40 degrees or below. Never taste food to determine its safety. 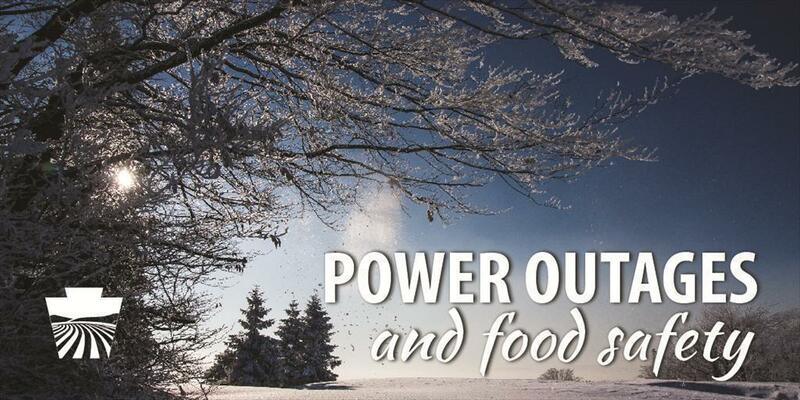 Use dry or block ice to keep refrigerators and freezers as cold as possible during prolonged power outages. Fifty pounds of dry ice should maintain a full, 18-cubic-foot freezer for two days. If the power has been out for several days, check the temperature of the freezer with an appliance thermometer or food thermometer. If the food still contains ice crystals or is at 40 degrees or below, the food is safe. Above all else during this winter weather emergency, we encourage you to be informed, prepared and involved. For more detailed information about emergency preparedness, visit www.readypa.org​.